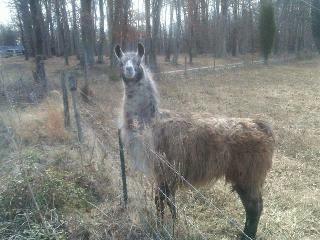 A llama tried to attack a man and later head-butted a deputy’s patrol car in Cleveland County. A man called for help after the animal escaped a nearby pasture and tried to attack him. A county sheriff’s detective was in the area and responded to the call. But when the detective arrived, the llama had a plan of its own. The detective tried to distract the llama by blowing a horn and sounding his siren, but it didn’t work. At one point the llama head-butted the detective’s patrol car. Authorities later found the pasture from which the llama had escaped and, with the help of animal control officers, they got the animal back inside the gate. When animal control officers opened the pasture gate, the detective drove his car in and the llama followed. The detective did a U-turn, came back out and shut the gate. “He was after me,” Griffin said. “I don’t know why he was after me.”He added: “That thing jumped on me and knocked me over into a wood pile.”Griffin said he ran from the llama and jumped into his car for cover. The animal then attacked his car, he said, head-butting it and hitting it with its hooves.“He was all over me and that car, both,” Griffin said.Griffin then made a 911 call that stunned dispatchers.“Your phone is breaking up. What’s got you hemmed up?” the dispatcher asked.“A llama,” Griffin said.“A llama?” the dispatcher replied.A Cleveland County detective came and tried to scare the llama away with his horn and siren. It then started to chase his car.The officer led the animal back into his fenced-in pasture, then did a U-turn, came back out and shut the fence.He said minutes later, the llama was calm and approachable. The animal’s owner said the llama just likes to smell new people. I know that llama. I worked with that llama. That llama ,sir, is no criminal ! Llama is a very dangerous because when they start attacking they wont stop it. That’s why its very possible if Cop Hating Llama Attacks Man just to save that poor man. I agree with you megasheng, Llama is certainly dangerous. I think the owner or caretaker should be responsible for that. Punish them! Each the Llma!